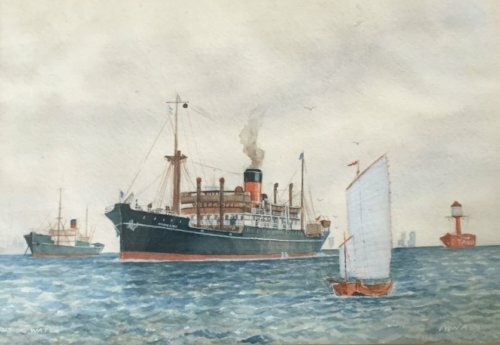 The SS Ting Sang – Port Glasgow built, first owner, Indo-China Steam Navigation Co. Ltd.
Stephen Davies: The ship is actually the Ting Sang or, in most databases, Tingsang. Jardines usually had the separate words, but almost all databases like Lloyd’s Register perversely joined them up! 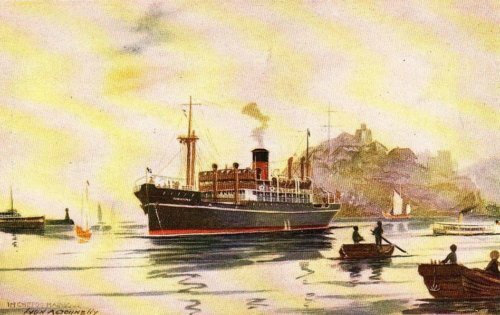 The Ting Sang first arrived in HK from acceptance, coming from Glasgow via Tourane (Danang) on April 21st 1922, going to mooring C29 and immediately afterwards going into regular service on the China coast HK-Shanghai, departing on 30th April. She was skippered by Capt C. Campbell from acceptance and for the next few years. Perhaps the most baffling bit of data about her is in the National Archives. There – BT 389/30/15 – a card which tracks the Tingsang’s movements from 1940 to 1945 (and puzzlingly seems to have a complete blank from 1940 until she is in Trincomalee in August 1945!) suggests that at some point pre-war she had become the Tien Hsiang, which can’t be correct. What exactly the ship got up to during the war I have no idea. My hunch is that she spent it in the Indian Ocean/Pacific theatre and there is evidence (http://www.naval-history.net/xDKWD-EF1942.htm) that she was on regular convoy duty – this is a record of Convoy JS2X from Rangoon to Colombo in Feb 1942. She was back in Indo-China Steam Navigation Co. Ltd employ in 1947, see The Straits Times, 1 March 1947, Page 7 where she is leaving Singapore for Hong Kong and Kobe. Her subsequent years 1947-54 are quite well tracked, her shift to the Panamanian register once she became the Oriental Phoenix being recorded in the SCMP on Jan 21st 1950. 09/1965 sank at Calcutta while under repair, refloated 08/11/1972, broken up in 1973. I have a hunch that in Beancaker to Boxship there may be a picture of the ship as the Oriental Phoenix in the Tung Group story, even if it isn’t in the Jardine section.